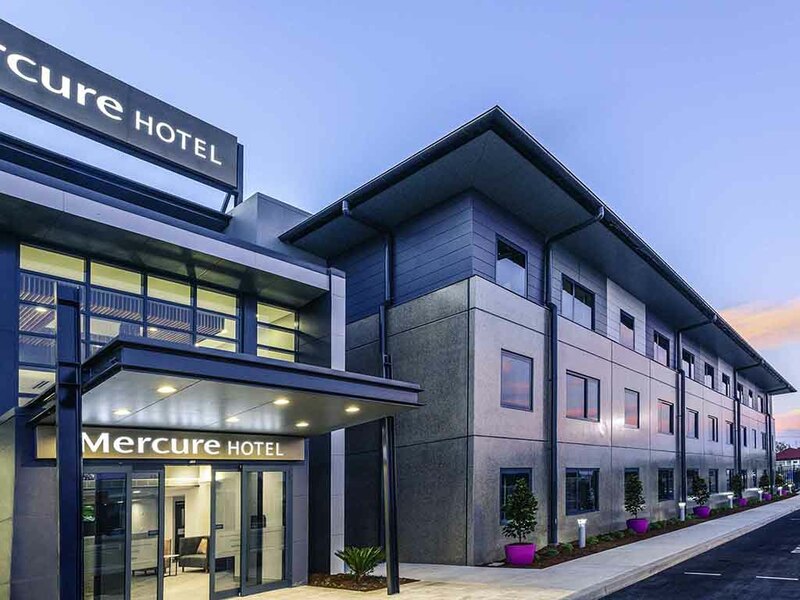 Mercure Tamworth offers upscale accommodation for all occasions. Boasting 52 meticulously designed rooms, a corporate meeting room, heated pool and gymnasium, this brand new hotel is a gem in the heart of Tamworth. Connected to West Tamworth League Club, it places you in a hub of entertainment, especially during the Country Music Festival. Surrounded by the picturesque mountains of the North West, the sophisticated hotel offers the best experience for your stay. AccorPlus dining discounts do not apply. Quiet location with easy access to major highways and Tamworth city centre. Direct access to West Tamworth Leagues Club and Scully Park. Modern leisure area with swimming pool and gym. Rooms with you in mind - suitable for the corporate traveller and family alike. Shuttle bus service available to select destinations. Banjos Family Restaurant offers a comfortable dining experience. An ideal for the whole family. The menu includes Australian cuisine and traditional comfort food. Operated by West Tamworth Leagues Club - no AccorPlus discounts. Open daily until late to satisfy those food cravings, the café offers light meals in a comfortable setting. Enjoy wraps, gourmet salads, burgers, pizzas, coffee, cakes or homemade cookies. Operated by West Tamworth Leagues Club - no AccorPlus discounts. Legends Bar is a great place to relax and enjoy a cool drinks. With sports on the big screen and live music on Friday and Saturday nights, it is the perfect place to be entertained.Operated by West Tamworth League - no AccorPlus discounts apply. This small intimate Bar is perfect for a cool beer, cocktail or refreshing drink. Overnight stay on a Thursday night. Check in with Janine was very professional and friendly. Had us sorted and met all our expectations. Superior King Room was outstandingly clean, generous size and quiet. Blackout curtains worked so well we slept in! 10 out of 10 Mercure. Adjoining Wests Leagues Club, this should offer easy access to dinner /breakfast. This was where the wheels fell off. For us the food options in the Bistro were incredibly dated 1980’s club food at its worst. Very disappointed in the quality and the facility, intact my meal was inedible. Bistro old fashioned, tired and not in keeping with the Mercure brand. We did not stay for breakfast choosing to go else where for a decent meal. Such a shame Mecure, hope this can be improved, we would love to return. There was an incident of staff notifying that my case had been put in the car but when arriving at my destination 3 hours away the bag was not there. The manager got in her car and drove my bag to my next destination so it was waiting for me in the mornings. Super service and above and beyond. Very Comfortable, good service, good food . All good . Will stay again. Friendly service, very comfortable & convenient location. Lovely rooms. Unfortunately we went to dinner at the Club attached to the hotel but the staf failed to inform us that our 50% discount on meals would not be accepted at the restaurant. easy to stay, no problems, parking, room, ease to get to club next door was all good. It was excellent. The staff and facilities were perfect for a restful stay. Very good. Happy and helpful front office. Room clean and comfortable. Doona too hot and it's either on or off, assuming one doesn't want to have the air conditioner on all the time, which we don't. Only one easily movable chair meant one of us had to have breakfast in the room standing up. Finding TV channels was somewhat of a challenge as the initial range very basic. My wife and I really enjoyed our stay at the Mercure Hotel in Tamworth especially noting the Indigenous stay as well. Service was great as was the hosptality. Very good. Three minor suggestions: fly screens so the windows can be open, a recycling bin and a slightly larger fridge with a freezer section (handy for those on a road trip). The staff was extremely cordial and ensured my stay was comfortable. The rooms were clean and the photographs on the walls were outstanding. Friendly staff. Spacious rooms. Too few coat hangers and no shelves and non existent WiFi. Overall a pleasant stay. The motel served our purposes perfectly for an overnight stay on the way from Brisbane to Mudgee. Our experience of the Tamworth Mercure could not be faulted. The room was spacious, clean and comfortable - very nice to have two comfortable chairs and a table included so that we could relax there with a drink while watching the TV. The house-keeping ladies we met were very helpful and friendly, as were the ladies at Reception. The connection with, and ease of access to, the Wests Football Club is an excellent idea; the food there was of a very high standard and reasonably priced. Our only suggestion is that at some time in the future, a covered walkway be built between the carpark (which is covered) and the front door of the hotel foyer so that we would not have had to walk the 15 uncovered metres from the car to the foyer in the rain! Nonetheless, we will certainly be staying there again when next we visit Tamworth.